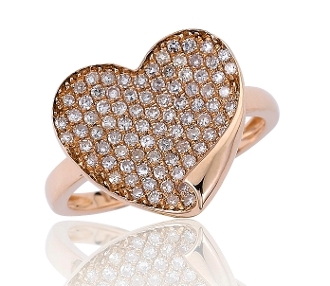 This fine jewelry ladies Diamond Flip Heart Ring features 0.57 Carat t.w. shimmering brilliant round pave set Diamonds. For a truly unique flare the lower point of the heart has a fabulous three dimensional curled edge design. Masterfully crafted in romantic, highly polished 14 Karat rose gold, this women's Diamond ring is sure to catch the eye. For added appeal, personalize your item, select our engrave option and indicate size needed when adding to cart.